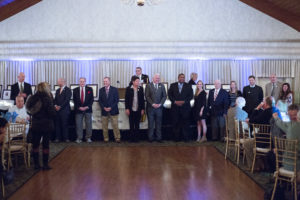 The Bucks County Chapter of the Pennsylvania Sports Hall of Fame proudly announces the inductees for the Class of 2016. Pete Cimino Jr. – Peter was a two sport star for three years at Bristol High School. He was a forward on the basketball team and a pitcher on the baseball team. He is best known for scoring 114 points in a high school game against Palisades High School. This achievement was a Pennsylvania record and second place in the nation at that time. Peter was named to the Pennsylvania All-State Basketball Team and received the Courier Times Athlete of the Year Award. Peter continued to play baseball as he signed a contract with the Washington Senators in 1960. He progressed through the minor leagues until he was called up to the Minnesota Twins in 1963. He spent several years as a reliever for the Twins with an ERA of 2.92. In December 1966 he was traded to the California Angels and pitched for them until 1966. Michelle Finegan – Michelle was a standout athlete in field hockey, basketball, and softball at William Tennent High School. She was named to the Suburban One All League Team and the All Intelligencer Team. At the University of Delaware, she was an excellent defender. She scored the winning goal in the AIAW Nationals vs San Jose University that secured third place for her team. Following graduation, Michelle continued to play field hockey at the national level. She was named to the USA National Team and was an alternate on the 1984 U.S. Olympic Team. She played on the National Team from 1981-86 and 1993. She competed on the team as they participated in tournaments in Germany, Canada, Holland, Australia, Wales, and England. She played in the USA American Cup in 1985. Michelle coached at St. Joseph’s University as an assistant and then as a head coach. In her ten-year tenure as head coach she led her team to seven consecutive Atlantic 10 Tournament appearances, two championship game appearances, and over 100 wins. She was named Coach of the Year on two occasions. Michelle also coached at Lehigh University and is currently coaching at C.B. East High School and is very active in the USA Field Hockey Futures Developmental Program. Pancho Micir – There have been many great athletes at Bishop Egan High School and one of the very best is Pancho Micir. He excelled in the sports of football and baseball. In football Pancho was named First Team All-Catholic in 1965 and 1966. He was the MVP of the City Title Game in 1966. His other awards included First Team All-Scholastic, Crowell Award as the outstanding scholastic football player in the Delaware Valley, Maxwell Club Award, and Knute Rockne Award. He was also named the National Football Foundation Student-Athlete of the Year and Honorable Mention All-American. Pancho enrolled at the University of Pennsylvania where he continued his accomplishments in football. He led the Ivy League in passing and total offense in 1970. He was the team’s MVP and the Daily Pennsylvanian Football Player of the Year. Pancho has dedicated many years to the coaching profession. He has coached eighth and ninth graders in football, softball, basketball, wrestling and track in the Pennsbury School District. His teams achieved more than 20 undefeated seasons with 13 consecutive in football. Matthew Rader – At Pennsbury High School, Matt achieved excellence in the sports of football, basketball, and baseball. He was a starter on varsity in all three teams throughout his high school career. In football he was First Team All-State and First Team All-League. He played in the Big 33 All- Star Game. The Bucks County Courier Times, The Trentonian, and The Trenton Times all named him as the Player of the Year. He received the Maxwell Club Award. Matt was named the National Football Foundation North MVP as well as the Philadelphia Eagles Bucks County MVP. In baseball he was also named Player of the Year in Bucks County, First Team All-League and Philadelphia Inquirer First Team. As a basketball player, Matt was a member of the All-County Team and All-League First Team. At Duke University, Matt starred in baseball and football. He transferred to the University of Pennsylvania where he led the university to the Ivy League Title in football. He was the Maxwell Club Team MVP and was the Burger King Scholar Athlete of the Year as well as Second Team All-Academic All-American. Following graduation, Matt has played on the USA Rugby Team and the USA 7’s Rugby Team. He is a member of the Pennsbury Hall of Fame. Craig Robinson – At Council Rock High School in the late 1960’s, Craig was a member of the varsity football, basketball, and baseball teams for three years. He was named to the LBCL All-League First Team in baseball and in football. He was also selected as the Player of the Year in football. Craig continued to play baseball at Wake Forest University where he was named to the All-ACC Team as a shortstop. He was drafted by the Phillies in 1970. After playing in the minor leagues for three years he played shortstop for the Phillies (1972-73), Atlanta Braves (1974-75 and (1976-77), and the San Francisco Giants (1975-76). His career hitting average was 219. He continued as a coach and manager in AA and AAA minor leagues. Jenny Stewart Rutecki – Jenny was one of the most prolific field hockey players at Neshaminy High School in the late 1980’s. She was a starting player on the varsity team for three years as she led her team to three league championships. She was named to the All-League First Team in her junior and senior years. The Bucks County Courier Times named her as Player of the Year in both her junior and senior years. In her career, she recorded 19 assists and 47 goals as a midfielder. Jenny was chosen to play in the Junior Olympics at the University of Kansas in 1988. Her team won the Gold Medal. In her senior year, she also was named a National High School All-American. She was also a member of the girls’ soccer team for two years at the high school. Jenny received a full scholarship to play at Penn State University. She started every game as a midfielder in her four years. She recorded 7 goals and 61 assists. In her time on the team, Penn State advanced to the Final Four in 1990 and 1992. She was a member of the United States National Team and Junior National Team and played in several international events. Jenny was named Freshman of the Year for the Atlantic Ten Conference. In her career, she was named to the College Field Hockey Coaches All-American regional and national teams in her junior and senior years. She was a member of the Big Ten All- Conference Team and the Big Ten Academic All-Conference Team. Following college, Jenny has coached at the high school level and is a P.I.A.A. official. Roger Sanders – Roger was one of the most outstanding wrestlers in Lower Bucks County in the late 1950’s. He won the LBCL Championship in 1958, 1959, 1960 losing only one dual meet. He was the District One Champion in 1958 and 1960. At West Chester State College, he continued his wrestling success. In four years he never lost a dual meet. He was Middle Atlantic University Division Champion on three occasions and the NCAA College Division Champion in 1963-64. He was named an NCAA All-American and has been inducted into Pennsbury, and several collegiate Halls of Fame. He was also inducted into the National Wrestling Hall of Fame. Following graduation Roger has coached wrestling at New York University (50-18-1) and Bloomsburg University (250-104-8). His teams have won the Eastern Wrestling League Championships on two occasions and the Pennsylvania State Athletic Conference Championship eight times. Roger has become extremely interested in assisting blind athletes in their athletic participation. He is the wrestling coordinator for the Unites States Association for Blind Athletes and has officiated in the Para-Olympic International Games. In November Roger was inducted into the Russel E. Sturzebecker Hall of Fame at West Chester University. Bryan Scott – Central Bucks East remembers Bryan as one of the finest three sport athletes in their history. He received nine letters in football, basketball, and track. In football he was named to the All-League, District One, and All-State teams. He was the Gatorade Player of the Year in Pennsylvania, a Parade All-American, a USA Today Player of the Year, and the AP Big School Player of the Year. He was a Big 33 selection. Bryan rushed for more than 3,000 yards in his high school career. In basketball, he averaged 21 points a game and was named to the All-League and District One Teams. On the track team he was the state medalist in the 100 Meters. Bryan played football at Penn State for the legendary coach, Joe Paterno. He was a four-year letterman and starter for three years on defense. Bryan had a ten-year career in the NFL. In his NFL career he played for the Atlanta Falcons, Buffalo Bills, New Orleans Saints and Tennessee Titans. Bryan created a non-profit foundation, Pick Your Passion Foundation, to encourage youth participation in the performing arts in underserved communities. He was inducted into the C.B. East Hall of Fame. Guy Stewart – As a Pennsbury athlete, Guy was the captain of the basketball team and played on the LBCL championship soccer and track teams. He continued his participation in basketball and track at East Stroudsburg State College. Guy entered the teaching and coaching profession at Willingboro High School where he coached track and cross country. He next coached J.F. Kennedy High School to a cross country championship. In 1968, he returned to his Alma Mater. For over three decades he had an illustrious career as he coached the cross country and track teams. His cross country teams won seven league championships and four District One Championships. In 1970, they were third in the state championships and second in 1975. He coached the individual state champion, Donna Gardener, in 1974 and 1975. His track team won the league on nine occasions and the District One Championship in 1971. They finished second in the state in 1988, 1992, and 1976. He has been named Coach of the Year on many occasions. His athletes have also been very successful at national meets. For his accomplishments, Guy was inducted into the Pennsbury Hall of Fame. Walt Snyder – Walt graduated from Danville High School where he lettered in football, basketball, and baseball. At East Stroudsburg University he continued to be an outstanding player in football and baseball. Walt began his teaching career at Woodrow Wilson High School. After seven years as an assistant coach in football, he became the head coach at Council Rock High School. His goal was to build the football program to compete with the other elite schools in the area. In his twenty-year career, Walt produced thirteen winning seasons, five league championships, and an overall record of 111-84-7. Walt served as director and president of the PSFCA for many years. He coached in the Big 33 game and was head and assistant coach in the Bucks County All Star Football Classic. More than 75% of his players attended collegiate institutions. Walt was named Coach of the Year and was elected to the Pennsylvania Scholastic Football Coaches Association Hall of Fame. He was also inducted into the Council Rock Hall of Fame. As a result of his dedication in the classroom and on the playing fields, the stadium at Council Rock was named in his honor. Wayne Helman – Pennridge High School Football and Track and Field Coach, Athletic Director, and PIAA Track, Cross Country and Swimming Official. Wayne was Pennridge High’s first football coach in 1954. He led his teams to six Bux-Mont Titles and three undefeated seasons in ’55, ’57, and ’64. He also coached the track and field team to two Bux-Mont Titles. Wayne graduated from Lansdale High School where he captained the football and basketball teams and was a champion high jumper. He was also Class President. Wayne went on to the University of Pennsylvania where he played football all four years. In 1982, he retired from coaching and became Athletic Director at Pennridge. For 56 years, Wayne was a respected PIAA track and field, cross country, and swimming official. Elizabeth ‘Betty’ Hess – Pennsbury Aquatics Director, Synchronized Swimming Coach, and International Swimming Judge. She was the captain of Temple University’s swimming and softball teams while a student in the early 1950’s. Elizabeth was the Pennsbury Aquatics Director for seventeen years and Synchronized Swimming Coach for forty-three years. She led the Falconettes to placement in thirty-five National Championships, was a member of the U.S. Synchronized Swimming governing body and 2003 winner of the Lillian MacKeller Award for outstanding service to U.S. Synchronized Swimming in 2003. She was inducted into the Temple Hall of Fame in 1983. James Jones – was a football, basketball and baseball standout at Bristol. He won the state title in the 800 meters two consecutive years and was the longtime track and field coach at Bristol. Nancy Almond Oliver – was a 12 letter winner at Bristol infield hockey, basketball and softball. She coached field hockey and basketball at Woodrow Wilson and Delhaas and started girls varsity athletic programs at Steinert in New Jersey.